The Great Sambino. You are now a year old. I can hardly believe a whole year has gone by and at the same time, it was one of the longest years ever! Adjusting to a life with two rambunctious boys who feed off of each other (good and bad) has been an adventure, to say the least. You’ve surprised me at your ability to play independently for so long. You love having someone play next to you, but you already show your preference for doing things yourself, your way. It cracks me up to see you get upset when I undo what you just did. You express you disappointment with grunts and “ehh”, while you toss whatever it is that I disrupted. Your love for your Dad is blatant. I’m not jealous at all, as you can tell. You clearly favor him and it’s so sweet. You and your brother both LOVE him tremendously. You clamor for time with him any chance you can get. He’s funny, fun, creative, attentive. Who wouldn’t want to be with him all the time? You recently switched to whole milk and love it, so long as it warmed to the correct temperature — otherwise you protest by arching your back and sobbing. You also tend to do this when your milk is finished. You take two naps a day and you’re one of the easiest babies to put to sleep. You are fine with rocking or not. Cuddling or not. Singing or not. At any point if I decide you’re too wiggly and you just need to rest in your crib until you fall asleep I kiss your head, lay you down and you protest for a maximum of 2 minutes. Then, you sing yourself to sleep. I’m sure it’s just a phase but it’s oh so sweet. You are currently getting your one year molars which has you drooling like a bulldog and nawing like a puppy. We didn’t have any crazy adventures this month, but rather we really enjoyed the “going through the motions” of every day life. Church on Sundays, naps in the afternoon, playing in the backyard, trips to the park, working in the backyard, meeting up with friends, making meals, doing chores, and learning to be together as a family. It was nice. 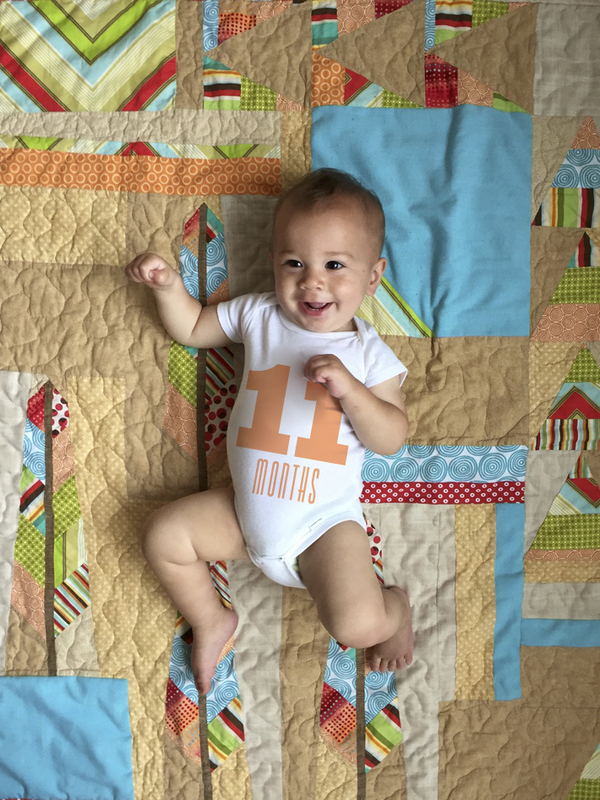 The biggest adventure this month was your First Birthday! We had some family and close friends come for a few hours and celebrate your day with us. We had your favorite food (pizza) and a pop corn bar with fun mix-ins, a pinata, and of course cake. Your mom tried not to go too crazy with the decor and games and such. She can get a little nuts. Between preparing for Good Friday service and Easter service, it helped keep me in check. Seeing all these wonderful people here to celebrate you and your one year of life had me all warm and fuzzy inside. You enjoyed your cake and we enjoyed watching the sugar kick in while you ate it. I look back at a year ago and I try to remember how it felt to hold you, 6 hours after you were born (due to complications for us both from delivery), and I just remember feeling peace. Feeling whole. You were what I needed. You were so little, needed so much attention and care, yet you were so easy and sweet — right from the beginning. God made you perfectly for us, for our family. We are forever grateful to Him for you. I can’t wait to see how much you grow and change in this coming year. We love you, Sam Sam. 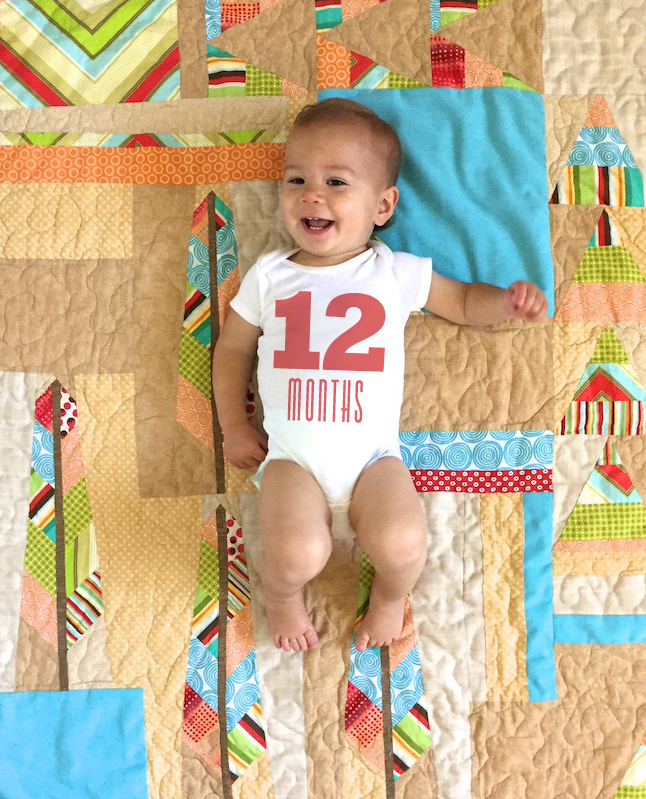 You are now 11 months old. You’re going to be 1 next month. You are a babbling, independent, opinionated, spunky, adventurous bundle of love. You are affectionate and sweet, have NO personal space, you give kisses and hugs and you love cars. You can play by yourself for an hour — I’m not exaggerating. You make “vrooooom” sounds while you play with anything that remotely looks like a car. You love your brother’s quad and you crawl as fast as humanly possible to it when you’re released to the outdoors. You’re starting to point to the things you want while grunting and you love to eat. Constantly. I’m going to have to buy a second fridge at the rate you and your brother are consuming the food I buy. Thank the Lord for Costco. You have 8 teeth now and are working on a new pair of lower teeth. You also had an awful cold this month which left you and your brother energy-less for almost a week. You still managed to smile through the tired and smear your snot all over everything. Even while sick you took your first step! Your great-cousin (I think? second cousin once removed? I don’t know) was playing with you on Grammy’s floor when you suddenly decided that you’d let go of the couch and take a step. I was floored. Badoom, #momjoke. This month was full of adventure. Mostly the Disney kind. Since we decided to get passes we’ve gone at least once a month. This past month we went twice! 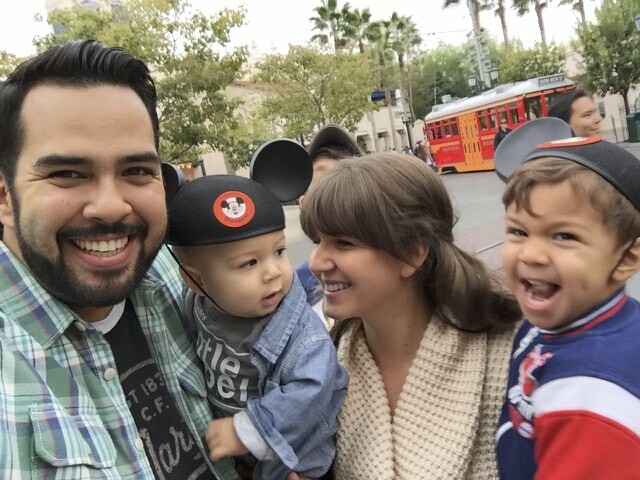 It’s been a blast taking the kids and I’m really hoping they don’t get too spoiled in the Disney way, because sometimes I think I enjoy it more than they do. We also made a trip up to Santa Barbara (gosh the drive up is gorgeous) to meet up with my cousin and her son at the Zoo. The Santa Barbara Zoo is beautiful and we could not have asked for a more perfect day. I’ve decided too that I need to have a 12 year old with me at all times. Gabriel was so helpful with the littles. Sam is starting to show more of his personality and preferences lately. When he doesn’t get what he wants or you tell him “no” he throws himself on the floor and flops around crying. I’m talking huge crocodile tears. It’s all I can do not to laugh. He’s also settled into his little brother role fairly well. The other day I set him up with his bottle, Teddy with an apple and I went to my bedroom to get dressed. While I was in my room I heard Sam cry/yell for a second and then stop. When I came out, Teddy was sitting on the couch sans his apple, which Sam was chomping on happily. Essentially, he’s learned that if he cries Teddy will give him what he wants so Teddy doesn’t get into trouble. Hah! I had to explain to Teddy the difference between sharing and enabling. And of course, once I took the apple away and gave it back to Teddy the “tantrum” ensued. Good grief. Whomever said, “boys aren’t dramatic” NEVER had boys. The bond between Sam and Teddy is growing day by day. Teddy is usually up first and while I’m doing my devos or making breakfast or let’s be real, waking up with coffee Teddy sits on the couch with some cheerios watching Daniel Tiger or playing in the play room. As soon as he hears the slightest whine in the monitor he jumps up and says, “Sammy’s awake!” We run into Sam’s room to see a happy baby grinning ear to ear as his brother runs to his crib and says, “Hiiiii Sammy. You have good nap, yeah?” Gah, my heart. They play together… like brothers. It’s not always nice, it’s not always gentle, it’s not always calm, but, Sam is learning to hold his own and Teddy is learning to be more empathetic. The days are a constant adrenaline rush. I can only imagine how many grey hairs I’ll have by the time they are 10 and 8. Lord, help me. 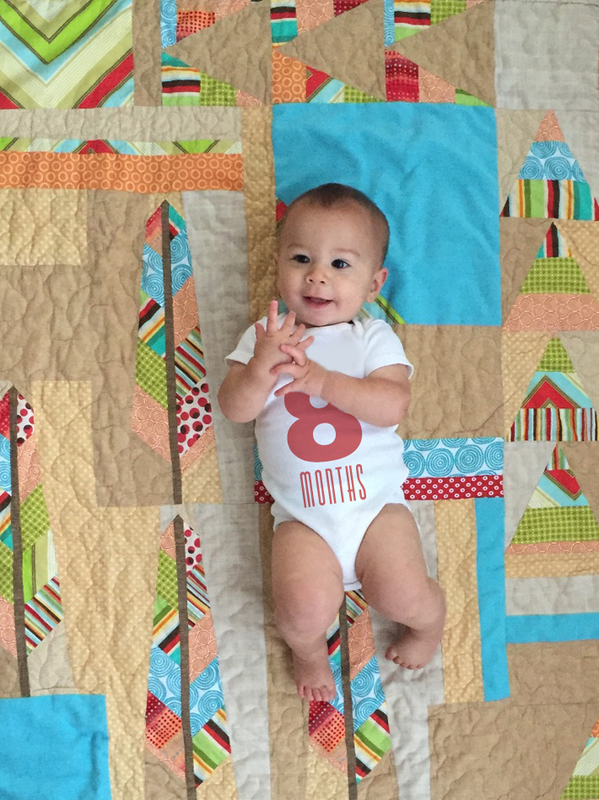 I can’t believe we’re entering into the last month of infant-hood. I’m not entirely sure when they are technically done being infants, but I like to imagine it’s until they’re ONE or walking. So, I’ll hold on to your last month of being my baby, before I officially have two toddlers. Ahhh! Every year our pastor takes us on a journey of walking with God through selection of “One Little Word (OLW)”. Each year around November/December I begin to pray about what that word might be. This year, the Lord put on my heart the word “joy”. I wasn’t excited about it. I wanted some profound word like my last two “acceptance” or”rooted”. Those sounded like words for which someone gave much thought. Earth shaking. Awakened. Joy? Joy sounded like a word someone would pick out of the air without thinking. “I don’t know what word to choose, so I’ll pick ‘joy’.” Nevertheless, it’s the word the Lord has for me this year. So, I began to pray on it. One of the amazing things about the journey we do as a church is that we don’t just pick a word and then cast it aside to be reviewed in a year. We all ask each other, throughout the year, “How is it going with your OLW?” We hold each other accountable in a completely shame-free way because we want to see God working in the lives of our friends and family. We love each other, truly. To be completely honest, my journey with my one little word hadn’t really begun until now. I’ve toiled over it. I think about it constantly, but God hadn’t really jumpstarted my journey into joy until today. Today I was reading my devotion, something that’s very rare as a mother of two little kids who are early risers. 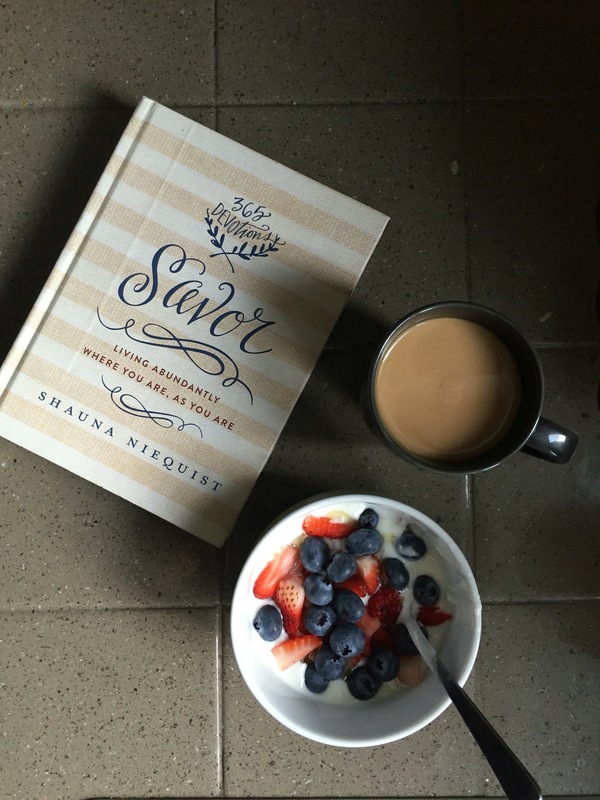 In my devotion there are five minutes segments with one verse, two paragraphs, and a call to action at the end. Today’s title for my devotion was “the whole story”. The passage selection for today was Romans 8:18, “I consider that our present sufferings are not worth comparing with the glory that will be revealed in us.” Now, I look at the word sufferings and I think “yes my day is hard, but I’m not really suffering in the way that I think of suffering.” The suffering I experience is more day-to-day “sufferings”. One of my kids doesn’t like the breakfast I’ve prepared, one is torturing the other one, someone pooped their pants, the dishes aren’t done, I don’t remember the last time I took a shower, etc. But, I’v always struggled with the idea that motherhood equals suffering. I’m sure that whole part is an entire blog post in itself, but my point is that even though my sufferings may not be monumental, in small ways I am toiling throughout the day. I get discouraged. It’s hard not to be when raising a two-year-old. I love my kids very much but man, they can be pretty ungrateful and mean. Yes! That’s me. It’s so easy to fall into this rhythm of complaining when you’re mother. Mostly because, it’s really hard to be one. It requires your entire being. Your body, your mind, your energy. It can truly be taxing. I often say to people, “I never really understood what 24/7 meant until I became a mother.” It’s this painfully beautiful dance between thinking about your beautiful children every second of the day and worrying that something awful happened to them every second of the day. It’s simultaneously stress inducing and rewarding. But that’s just it… I feel as though so often I focus on the sufferings part, that I forget the joy part. So, this is just the beginning of the journey. But I’m taking a step and turning the page so the rest of the story can be revealed. Lord, guide me through this journey of finding joy. Continue to reveal the story to me. The whole story. Thank you for your word, thank you for loving me, thank you for your patience and kindness with me. Help me to be the woman I’m capable of being. Amen. We’re about to finish out the year 2015 and enter 2016, where you will be turning 1 year old. How did this happen? 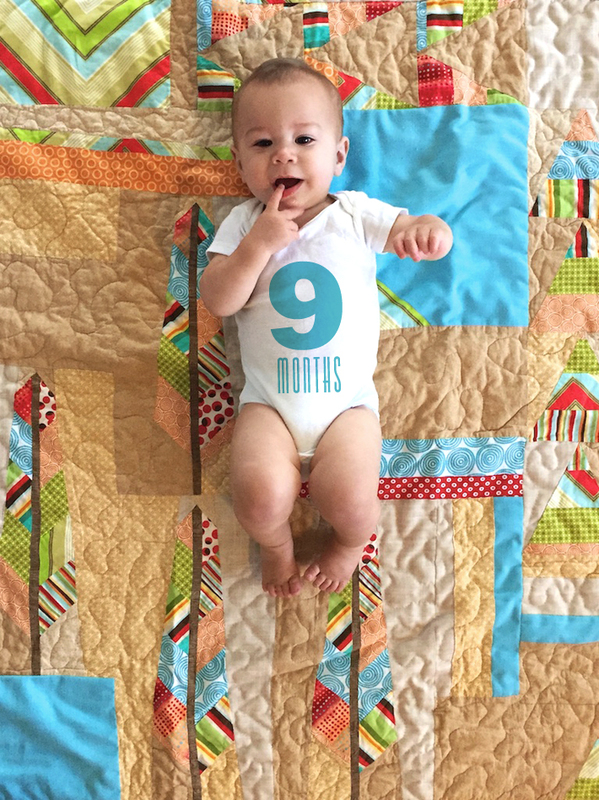 You’re already 9 months old. You’ve learned how to crawl, walk assisted, babble, speak some sign language, you’ve cut 7 teeth in total and you LOVE music. All of these things about your personality and your specific preferences are developing — it’s fascinating. 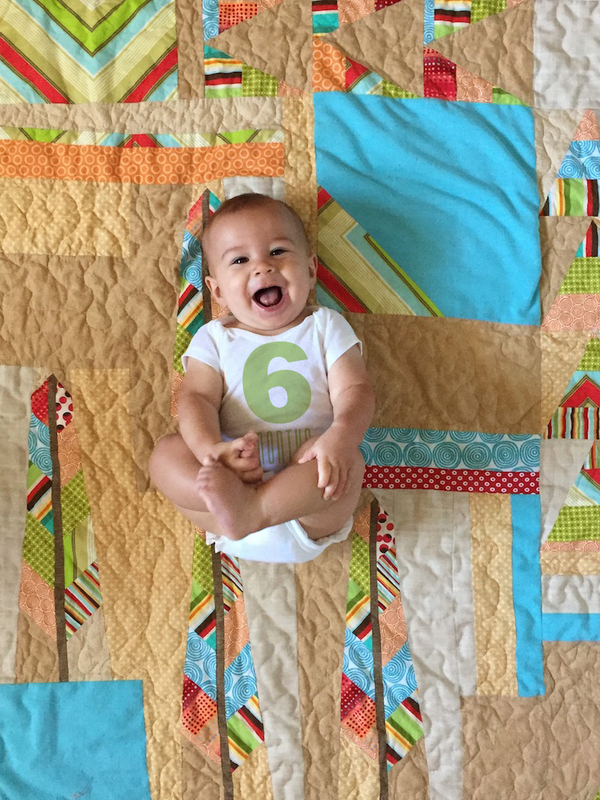 I know that “every baby is different” is something I’ve heard forever, but I nievely thought that for the most part, the first year of a baby’s life is pretty much the same across the board. It’s not so with you! You are definitely your own, individual person with likes and dislikes, wants and needs. I LOVE it. I knew being a mom was something special, but wow. Getting to raise two boys with such different personalities is absolutely fascinating to me. 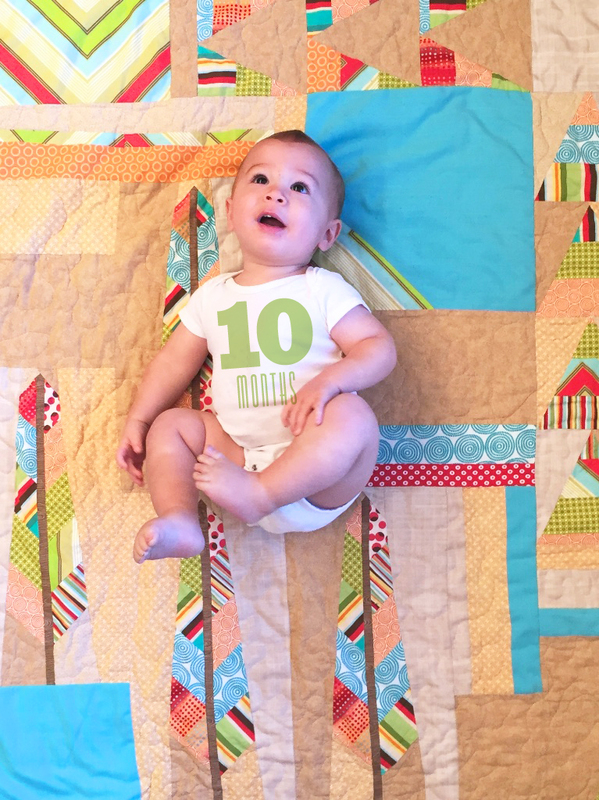 This past month we celebrated some of my favorite holidays with our littlest guy. Thanksgiving and Christmas. We always try and spend as much time as possible with as many family members as possible over the holidays. This means a lot of driving for us, but luckily both boys are champs in the car. We pretty much have a “Father of the Bride: Part II” map on which way to take depending on when we leave (does anyone else remember that part of the movie? Or is my type A, OCD organization showing?). Thanksgiving was spent splitting the holiday between the two sides of our family. Meaning we get to eat two thanksgiving meals! YUM. We started with lunch at my parents house, gathered around a large table with delicious food and great conversation. We ended the evening with another delicious meal, The Peanuts Movie, and a private recital given by Nana and her guitar. As we geared up for Christmas, everyone and their mother caught the flu! We did everything we could to avoid it and made it through Christmas without catching it… Until the day after Sammy’s 9th month birthday. But, more on that later. 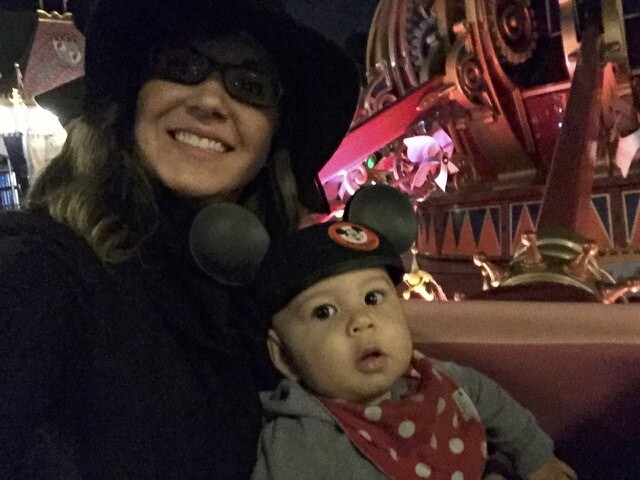 Sam went to Disneyland for the first time, this month! We liked it so much, we decided to get passes. I’m so excited to do, as my parents did, surprise us and say, “We’re going to Disneyland!” on a random day. Even though Sam is about 2 months older than Teddy was when he went, Sam wasn’t overly enthusiastic about Disneyland. He’s so go with the flow that it’s pretty much what he did for the two days we were there. He enjoyed the rides well enough, but I think he’s going to be out little observer — taking things in an not being overly expressive. Don’t get me wrong, this kid radiates joy, but he’s definitely one to think about how he feels before expressing it. Christmas, each year is SO fun! This year though was extra special. We spent as much of December as we could celebrating Christ’s birth by reading stories from the bible each morning, making Christmas cookies to pass out to the neighbors, sipping hot chocolate, driving to see Christmas lights, and listening to endless Christmas music. A new tradition we started this year is seeing the LA ZOO lights. It was only $12 for us to go, after hours at the zoo. Over 1/3 of the place is decorated for Christmas with lights, songs, a water show, reindeer, Santa, and more! The boys stayed up pretty late but it was a blast. 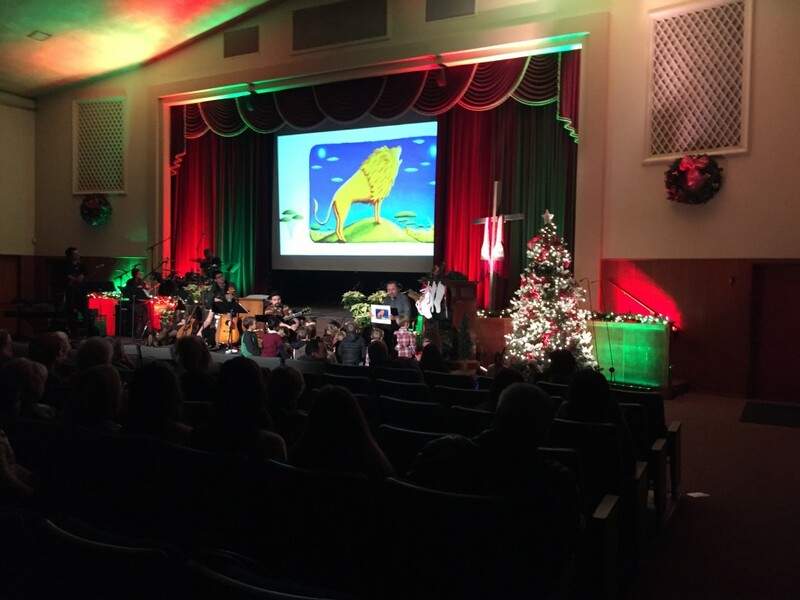 Christmas Eve, we have a church tradition — the candlelight service. I led a small group of our kids from Children’s Ministry in a song on stage. Our pastor read a story to the kiddos and we all lit candles and sang Christmas Carols. It’s about a homey as you can get between the carols, kids running around and the homemade cookies everyone brings. This year, our Children’s Ministry decided to raise funds and take present donations for a family that is living in a near by hotel. At the Thanksgiving lunch the church provides, we found a great family and began to pray about how we could give them a little Christmas cheer. The response was overwhelming. 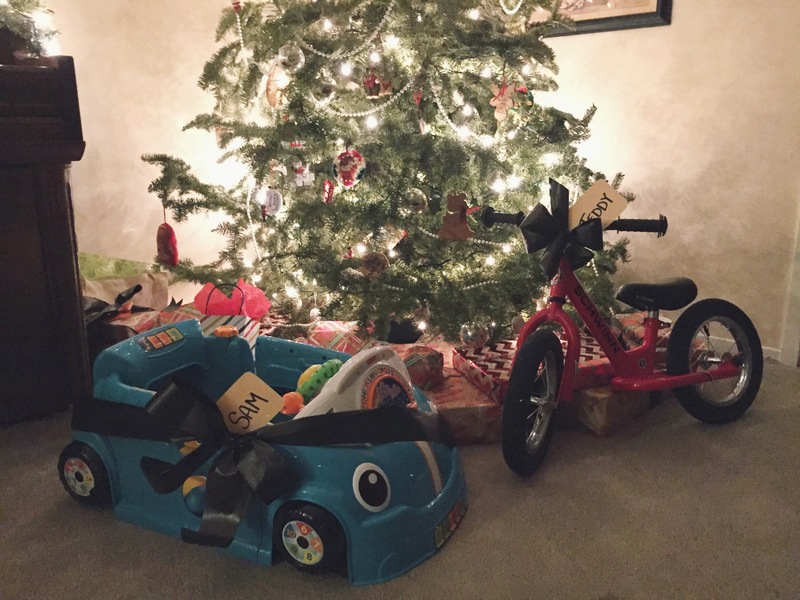 Between kiddos who donated their allowance to parents who purchase gifts, above and beyond what was asked, we were able to give a family gifts for Christmas on Christmas Eve! It was a blessing to be used in such a beautiful way and I know the kids were blessed to be a part of it. After Christmas Eve service, we always order Toppers Pizza and open presents with Auntie Jonna. She outdid herself this year with a mini drum set for Sam and wearable, color-able T-Rex for Teddy, plus so much more. Christmas morning was interesting. Sam woke up at 5:00, but Teddy slept in until 6:45. We only had one large gift for each of our boys so, we were anxiously awaiting the time Teddy would wake up and we could open gifts together. I always make my special hot cocoa recipe in the morning and I ALWAYS burn it. This year was NO different. The boys were finally all awake and walked/crawled down the hall to their gifts. Sam had a ride-in car with some stacking cups and Teddy received a balance bike with a helmet and pads. Both boys loved their gifts. We then, split the day with family! The Lopezes first and then the Thomazins. Opening presents with kids is a riot. These kids are so sweet, hilarious, and radiate joy. 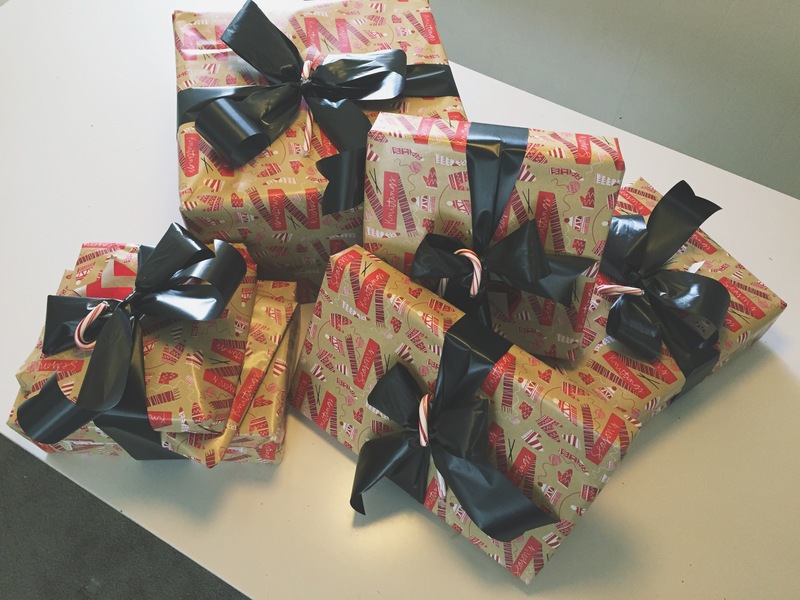 We started the day off with brunch and then went straight into presents. Spending time together, watching the kids open gifts and then play with them outside happily has got to be my most favorite part. We all sat around the fire drinking coffee and watching the kids play with their new toys. We rounded out the day with a gift exchange, more delicious food and more hot cocoa. So much laughter, family stories, and recipes were shared. There’s something about going home for Christmas, isn’t there? You walk in, smell the familiar smells, tasty food, warm voices and every single Christmas of the past comes flooding back. I wish I could bottle up that feeling, or capture it somehow. That way in the dreary, not so warm Christmasy times I could pull it out and inhale. Here’s to another month and a new year! You’ve grown up so much this past month. We are a crawler now, a screamer when you’re hungry, and a champ at saying, “Mama!” You can also pull yourself up on things and then promptly fall over. You love music. You rock back and forth to a family favorite, “Uptown Funk”. Or, the “Doh, Doh Song” as it is more affectionately known by your brother. We play “Stop. Go.” And you dance and stop with the music. Your laugh is so joyous and blasty. I LOVE it. 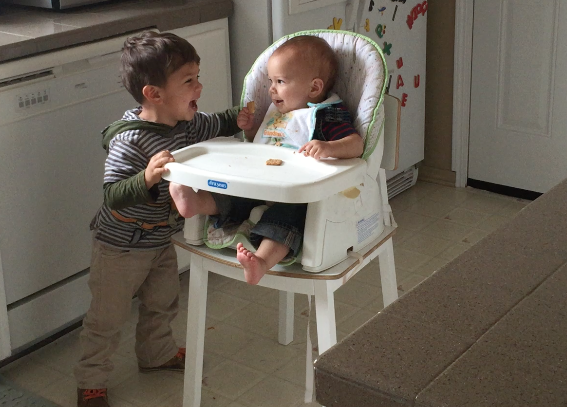 You can play “peek-a-boo” all by yourself and you love when your brother plays it with you. You want/need me a lot these days. Only me. You’ve started to cry if I had you off to someone and you really just want me to hold you. If I’m not holding you, you crawl around crying or climbing up my leg crying. You also have developed a good fake cry. It’s lovely. You were sleeping through the night, but now you’ve managed to decide you want me multiple times throughout the night too. Your Dad has been a champ and gets up with you during the night too so I can have a break. We’ve had so many fun adventures this month! 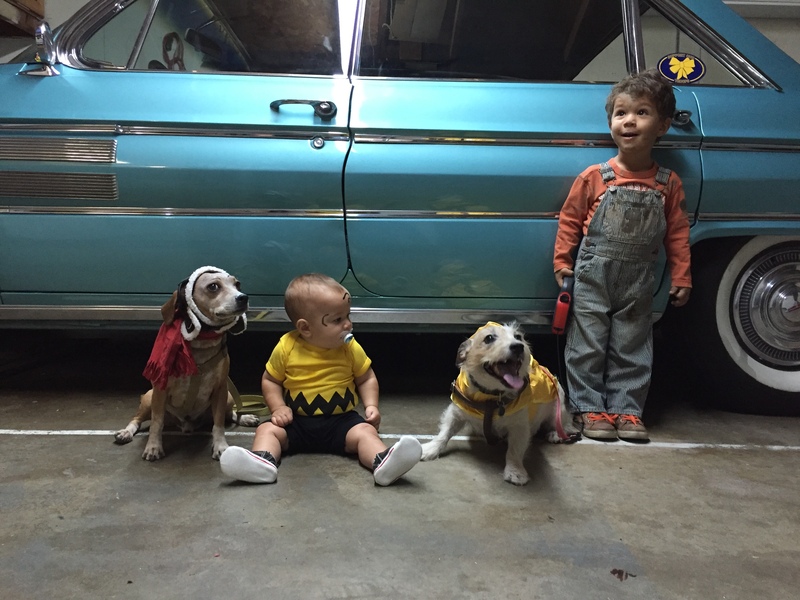 This month you had your first Halloween! We started the festivities with a trip to Conerstone Church’s trunk-or-treat where you and your brother dressed as an old race car driver and you were his mechanic. You’re a blast, kid. Always up for anything and always smiling. 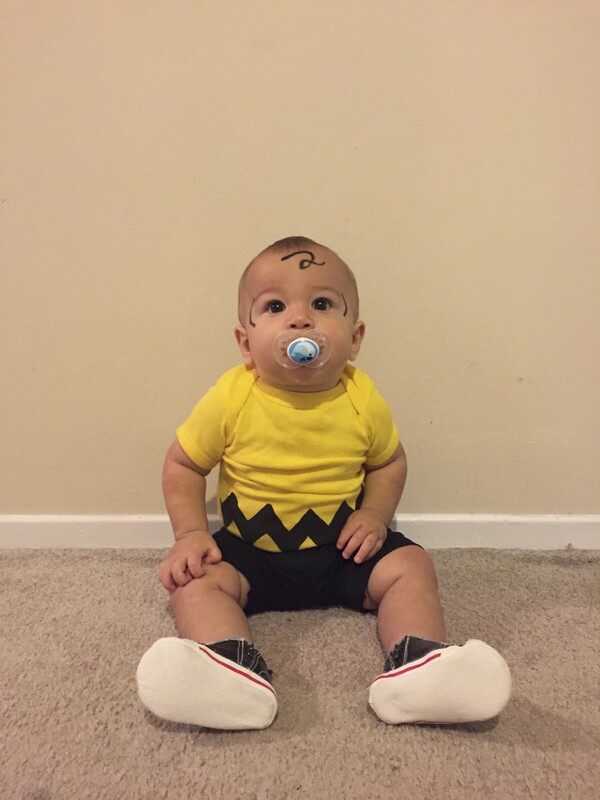 On Halloween night, Nana and Papa came up and we dressed you as Charlie Brown. If you weren’t the cutest Charlie ever, then I don’t know what else! You traveled out of state for the first time, to Arizona. There you met your GG Mary and GG Primo and Great Uncle Tony. Your brother ended up with a high fever while we were there and soon you followed. Thus, the next two weeks we would face fighting a family cold, you teething, and double ear infections for both of you boys. Phew, that was rough. We also made a trip down to Riverside for a few days to help Auntie Amy and Uncle Trav — and to hang out with them, because we love ’em. You sure do love playing with Chan and Tess and they love you! You had a visit from your Great Auntie Ro too! She came and spent the night with Nana and Papa. We went to the Reagan Library (a beautiful place)! I know the next month is going to full of even more fun adventures, and I can’t wait to see you grow more and more into the amazing, fun kid I know you already are. 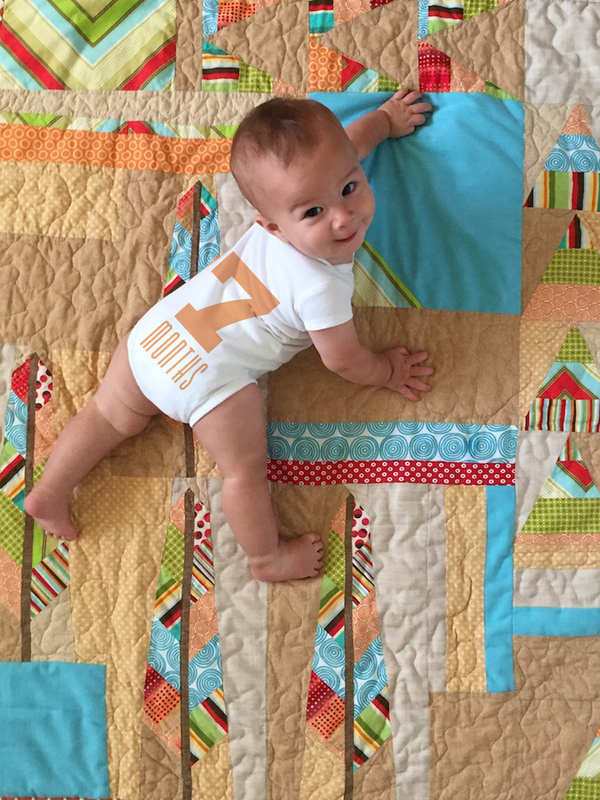 Yesterday, Sam crawled. We’ve been trying to get him to do it for some time now, but he’s just been army crawling everywhere. We joke that he sounds like a zombie baby dragging himself around the house. He’s super speedy at it and can turn 180 degrees in a second. 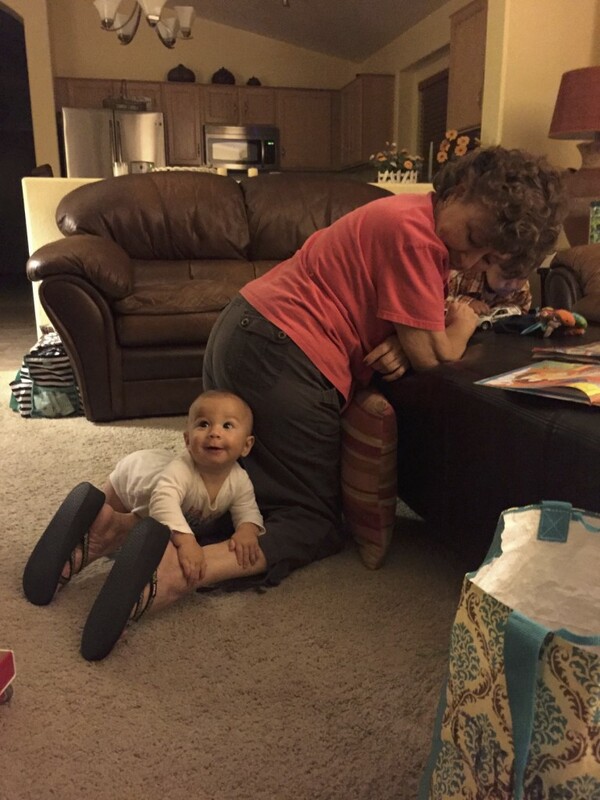 So, now that he’s actually crawling we have to watch out! He’s a crawling machine. The sweetest part of it all is that he crawled for the first time to his brother. Ugh, my mama heart BURST! Teddy has been so sweetly encouraging Sam to crawl and being so patient with him. To see both of their hard work pay off was such a joy to see. They both were delighted. The most sad/funny thing is when Sam crawls and cries. He looks totally defeated. And then when he gives up and lays on the floor crying it’s so cute and pathetic. 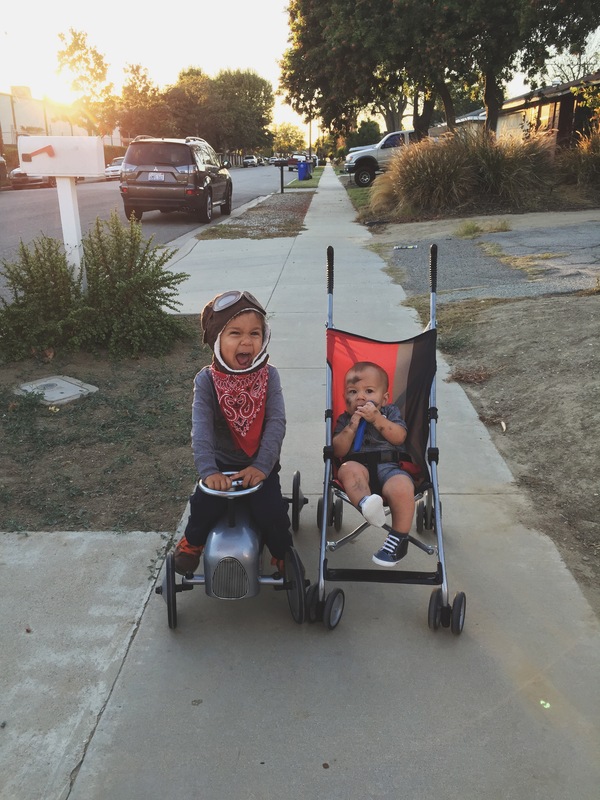 Now, before you go thinking I’m the worst Mom for letting my kid cry like that — I’m not. This kid wants me to hold him, nurse him, rock him… All the time! Which means that when I put him down I have a crying, crawling, mess of a child. He’s so adorable when he does it though. I can’t bring myself to let it carry on too long before I’m scooping him up while the toddler is either wrapped around my leg, pulling my pants down, or trying to scale me like a mountain. We official have a mobile baby on our hands and now our whole lives change! Vacuuming the carpets every day is a must. This kid puts everything in his mouth. Alex says he’s better than a Roomba. Yes, that’s what we call you. Yes, we sing it in the vocal stylings of Fankie Valli and the Four Seasons. Yes, you love it. You’re over half a year old now AND we’re about enter into my FAVORITE time of year! The Holidays. 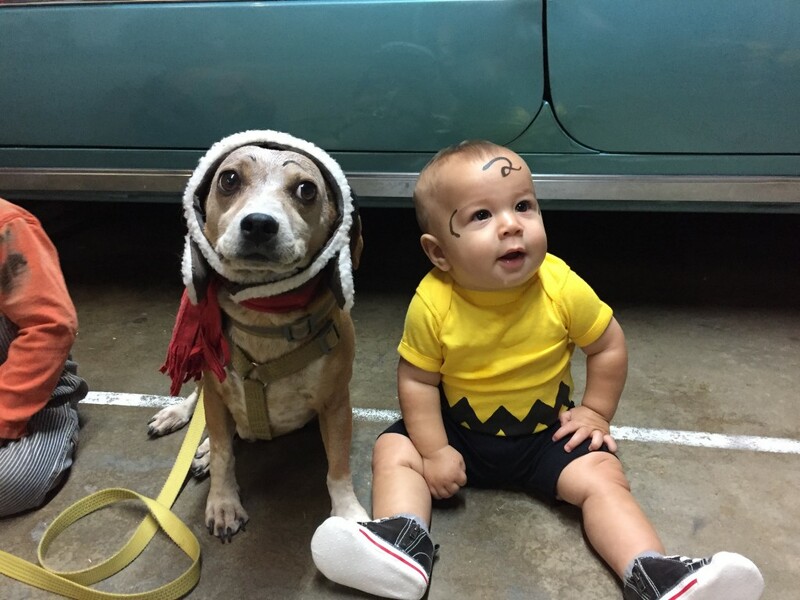 First up, your first halloween. I can’t wait to get you all dressed up and take you and your brother around the neighborhood. We LOVE our neighbors. They are literally the kind of people from whom you can ask for sugar! The month was so fun in most ways and challenging in others. Your first adventure was seeing the Blue Angels in the airshow at Pt. Magu. Your cousins, Nana and Papa went too and you all loved it. We loved it so much, we went both Saturday and Sunday to see them. You continue to be the easiest, sweetest baby. You wore your ear muffs to protect your ears so well. You even fell asleep while wearing them. You started scooting around/army crawling and you’re are mighty fast at it. You can basically follow your brother around now, which you both are loving. You sit up on your own very well and have started to munch on a few different things. Since you have your bottom two teeth now, it’s unbelievably cute to hear the “crunch, crunch, crunch” of you chewing your teething biscuits. Great Grandma, Grandpa and cousin Elyse came to visit this month. We took them to our favorite spot! Underwood Family Farms. I can’t wait until you’re walking and I can take you boys there to run around. You guys always seem to have a blast there. Your Dad and I got to get away for the night with friends to the Bluegrass Festival in LA. You Auntie JuJu and Uncle Thomas came to watch you both and you were an angel for them. No surprise there. – Carrots and Eggs (Not together. That’s gross). Honestly, for the most part you are pretty amicable. You don’t have strong dislikes, except for the above listed. I mentioned that this month was also hard. You were extremely sick this month and teething, I think. 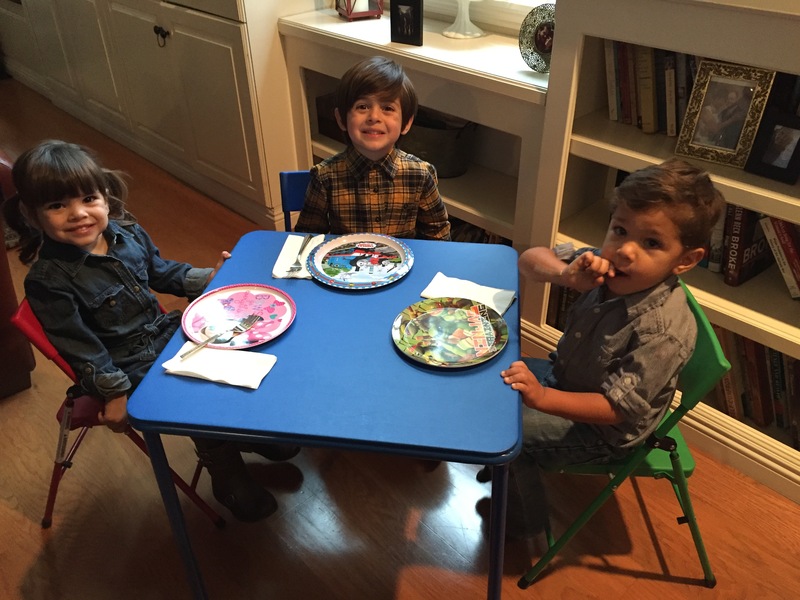 You had to miss your cousin JuJu’s birthday party and we were so sad! The sweet part of it though, was that I was able to get a whole 24 hours with just you while Daddy and Teddy went on the pirate ship in Big Bear. We watched Gilmore Girls and wrestled on the floor, while practicing your crawling. Our biggest adventure of month was camping! We go, every year, with our church to a campsite in Carpenteria. The first time we did it, your brother Teddy was just 4 months old. You, of course, were a champ. The day before the trip I sliced my thumb on a mason jar and needed 5 stitches. Do you know how hard it is to change diapers with a bum thumb? Especially since “getting your diaper changed” is on the dislikes list. Sickness and all, you continue to be my snuggly, sunshine bear. You LOVE me. No, I mean it. I’m totally your favorite. I’m soaking up every single second.